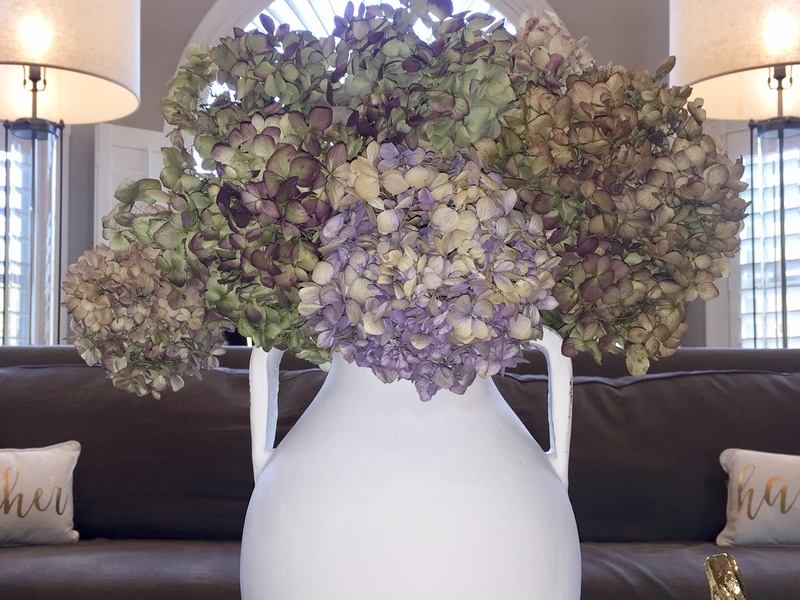 Anyone else grow and love hydrangeas as much as I do, and would love to have them around the house all year long? We’re in luck, drying hydrangeas is the answer. The biggest challenge in drying these beauties is finding the correct time to cut them. If they are cut too soon while still in bloom, they retain too much moisture and won’t dry quick enough to keep their color. If they are cut too late, they will turn brown. The ideal time to cut hydrangea blossoms for drying is toward the end of the season, typically August through October. The hydrangeas in my garden have picked up beautiful colors of pink and green. To get the best blooms, don’t pick the flowers after a heavy rainfall, the flowers will retain too much water. There are several ways to dry hydrangeas, one way is to let them dry on the plant and pick them when the petals feel like paper. A better method is to cut the flowers with a 12-18″ stem, remove the leaves from the stem, and place in fresh water, ensuring the stems are covered at least half way. Place the flowers out of direct sunlight and allow the water to fully evaporate. Once the petals feel papery to the touch they are ready to use. A third method is to air dry, by hanging the flowers upside down, but this method will make the petals more brittle than the water method. One last tip to preserve dried hydrangeas, spray them with hair spray after they are fully dried, this will help them retain their color. Lastly, enjoy your beautiful dried blooms. Feel free to tweet, pin, and repost this article. Follow along on Instagram HERE and subscribe to Happy Haute Home to get bi-weekly posts delivered to your inbox. Oh, this is a wonderful post! I’ve always wondered how to do this! Thank you; thank you!! You’re most welcome Lynn, glad you found it helpful! Fantastic! Glad you popped by for a visit.